In the maritime Pacific Northwest, warm, sunny spring days are rare enough to be remembered, and clear, moonlit nights with just the right breeze for sailing are even rarer. 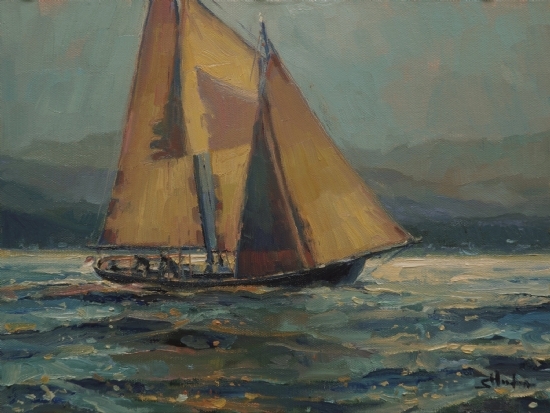 Set within the confines of a 9×12 miniature, the sailboat gives the impression of quickly moving out of one’s view, demanding that the viewer look now before only the movement of the wake is left behind. Moonlight Sail, one of three works chosen to be part of the American Society of Marine Artists’ Show, Between the Shining Seas, is sold. More art by the Norwegian Artist, Steve Henderson, is availaable for sale and view at Steve Henderson Fine Art.